How to feed German shepherd ? HomeHow to feed German shepherd ? A German shepherd has some physical requirement that means German shepherd needs some high-quality food. German shepherd loves physical exercises and they stay active most of the time. The German shepherd has energetic nature that’s why German shepherd requires power diet. For German shepherd, you need to include some protein-rich food to keep him healthy. German shepherd dog requires at least 20-24% of the protein in their diet because protein plays an essential role in the growth of the German shepherd dog. If we give a poor quality and quantity of protein to German shepherd dog then it is harmful to him. To make German shepherd food tasty then protein plays a major role because it increases the taste and fat quantity as well in his body. As the owner of the German shepherd, you have to understand that we give him a required amount of food on a daily basis. If we give him an improper amount of fat then it will lead to having major health issues such as hip dyslexia. 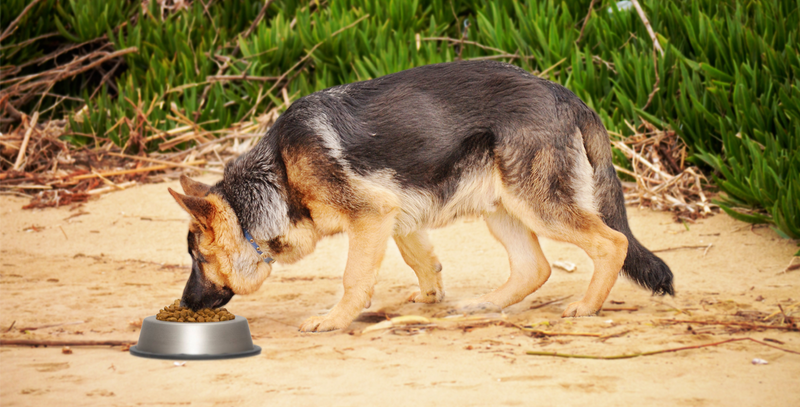 In this article, we will help you to understand how to feed your dog on the basis of his age. As an owner of a German shepherd, you have to understand this factor such as provide a similar amount of nutrition from outside food as they are getting it from their mother’s milk. You should prefer that your puppy will take as much amount of mother milk because mother milk has micronutrients and antibiotics which are very important for your puppy health. When your puppy is of 12 Weeks, You have to change his diet by replacing wet food with dry food to prevent him from health issues such as diarrhea and vomiting. The best way to prepare a mixture of food is to add some amount of dry food into wet food and then slowly increase the amount of dry food amount from 15-20% after a week. When your puppy is of 6 months old then you have to add non-vegan food in his diet. You can give him crushed bones, mashed liver, and some raw and boiled eggs. This type of non-vegan food improves the immunity of your German shepherd and prevents him from minor health issues. In this article, we have included some tips which are useful for you to maintain the diet of German shepherd and manage the exact amount of protein in his body as per the requirement. If you have any issue you can contact us, we will provide you the assistance.